Bookride: Book of Mormon. 1830. 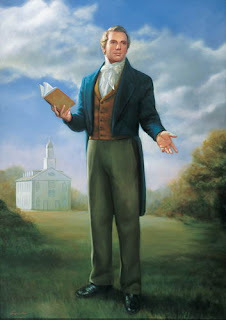 Joseph Smith. BOOK OF MORMON. AN ACCOUNT WRITTEN BY THE HAND OF MORMON, UPON PLATES TAKEN FROM THE PLATES OF NEPHI...Printed by E.B. Grandin for the author, Palmyra, N. Y. 1830. STOP PRESS. March 22 2007. A first edition Book of Mormon, in its original binding, that was signed by early LDS apostle Orson Pratt, and with an inscription by its owner, Denison Root, indicating "the book was a gift from Hyrum Smith," brother of church founder Joseph Smith sold for $180,000. A new record for the book and showing the power of provenace and association. Root was married to Phoebe Hale, sister to Emma Hale, who was the wife of Joseph Smith.